The disturbing fairy tale version of the Final Destination franchise. Burton's visual style is an assault on the senses, featuring some spectacularly awful gross-out moments. 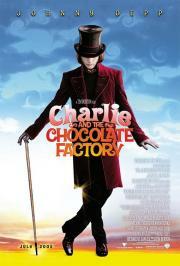 This film is just full of questionable choices: from the musical numbers to Johnny Depp's performance to all of the time devoted to Willy Wonka's backstory. There is a certain perverse pleasure to seeing these awful kids die, but -just like any chocolate out of this factory- it's sure to leave a bad aftertaste.